As your babies grow, so do the offerings we have to support you! Check out Kindermusik, Infant Massage, Baby Signs and Kids & Family Yoga Classes that we offer below. Introducing the World through Song and Dance! You’ll witness your child’s developmental evolution in language skills, literacy, listening, problem solving, social skills, self-esteem, and musicality. And it happens within a nurturing environment-full of energy, imagination, music, dancing, and playful delight. 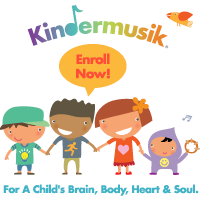 Miss Helen offers two different tracks of musical curriculum: Kindermusik classes and her own Music with Miss Helen classes. These classes are appropriate for infants through ages 3 1/2 and Helen has ongoing sessions for different age groups. Learn more about joining the current Spring Session (You can start in the middle!) or about upcoming Summer 2019 Classes at the link below! Helen also offers FREE trial classes, contact her for more information. It’s a physiological phenomenon that requires ongoing cultivation, practice, and investment. Infant Massage is an incredible tool to enhance bonding and this class is a great place to start! When we make skin-to-skin and eye-to-eye contact with our babies during massage routines, the production of Cortisol (stress hormone) temporarily ceases while simultaneously, the production of Oxytocin, Serotonin, and Prolactin (bonding and growth hormones) increases. Which means both you and baby will feel the positive effects! This class series is so much more than simply learning massage strokes. Your babies senses are being stimulated from the sound of your voice, the smell of your skin, the sight of your smile, and the touch of warm oil in your hands. It is the rhythmic, repetitive and caring interactions from you that help form your babies synapses increasing optimal brain function and development. Learn to safely massage your own baby in this fun and educational, three week series. We are offering a Baby Signs 101 workshop taught by Megan McCue, CCC-SLP. Baby Signing 101 is geared towards parents (who are always welcome to bring their babies/toddlers). You will learn the basics of language development, how/when/why to sign with your baby, FAQs about signing with babies, Do’s/Don’ts of signing, as well as the top 20 signs to start with. You will go home with everything you need to get you signing through the first year with baby. We are also offering a Sign & Play 4-Week Series. The Sign & Play class is typically 45 minutes long, and includes games, music, stories, and more, all while signing! It is specifically created to engage babies aged 0-18 months old, and will not include a lot of “technical jargon” for parents. Led by Camille Potter, and geared towards ages 2-12pm we spend our time together learning yoga principles and postures through play, story telling, song & dance, to enhance self awareness and understanding both mentally and physically, to develop compassion and empathy for others around us and to provide children with a foundation for self care that they will carry with them for the rest of their lives. Children may be dropped off for this class if they are able to participate without the assistance of a parent. $10 drop-in and Inspire Charter School funds are also accepted for homeschool students. Please go through the vendor order process with your school to get signed up prior to attending classes. To learn more about the class or sign up, please email Camille at Cami_lou@yahoo.com.